In the kindergarten classes I’ve experienced, color patterns are a hit with the kids. 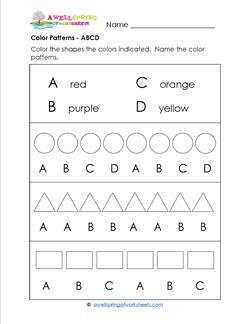 Use the ABC and ABCD pattern keys at the top of the worksheets to color the shapes and the bugs (bees, ladybugs, and butterflies) in basic colors. Great but simple lessons for kindergarteners and if you’re in a crunch, fun little time fillers, too. The two worksheets also serve as reinforcement of the shapes. Have kids say the patterns out loud to themselves or to each other to practice using verbal skills. Get out the crayons to color these shapes different color patterns. Patterns are ABC, AABB, and ABCD. Name the color patterns: "Red, red, purple, purple", etc. 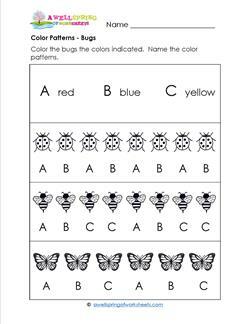 Lady bugs, bees and butterflies grace this color patterns worksheet. The patterns include AB, ABCC, and ABC. Name the color patterns. 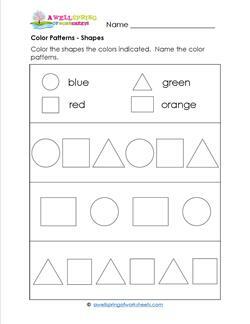 This color patterns worksheet has only simple AB & ABC patterns in the basic shapes of circle, square, triangle and rectangle. Name the color patterns.